The snooker star allowed a member of the audience take over at the English Open today. SNOOKER STAR RONNIE O’Sullivan was involved in an unusual situation at the English Open today. The British snooker legend was on the verge of completing a 4-1 victory against Zhang Yong, when a spectator interrupted his progress. Despite hitting three centuries and being one ball away from a total clearance of 136, he let the woman in question take over amid much bemusement at Barnsley Metrodome. “I really wanted her to pot it,” O’Sullivan, who will face John Higgins in the fourth round, told Eurosport afterwards. 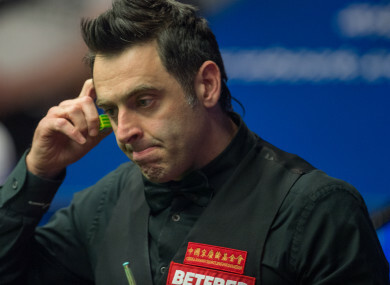 Email “Watch: Ronnie O'Sullivan lets stage invader attempt to pot the black”. Feedback on “Watch: Ronnie O'Sullivan lets stage invader attempt to pot the black”.